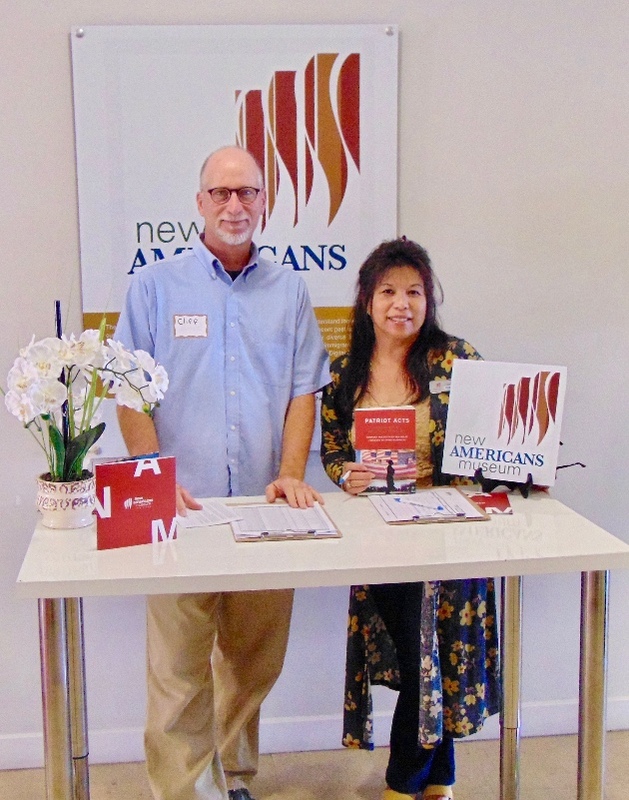 The New Americans Museum (NAM) in San Diego, CA has embraced a critical responsibility in American history and culture: promoting understanding and interaction between immigrants and native-born Americans. In the era of Trump, this is no easy feat. Shortly after the 2016 election, the museum was vandalized with anti-immigrant graffiti declaring, “Too much immigration! Go back to your country. This one is ours!” Hate crimes like these send newcomers a foreboding message: you are not welcome. A photograph of the New Americans Museum’s vandalism in 2016. In this climate, NAM’s work is more important than ever. That is why they reached out to Voice of Witness. We’re collaborating with NAM to create an empathy-based, ethics-driven story gathering process that represents new Americans’ stories in an empowering and dignified way. VOW EDU Director Cliff Mayotte with NAM volunteer Evelyn Leano at our workshop. In October, we hosted an oral history workshop with NAM and local educators to teach them the skills, ethics, and social significance of creating oral history: how to form a safe space for narrators, what types of questions inspire detailed stories, and ways to bring NAM’s work back to immigrant communities. With VOW’s guidance, NAM will “preserve the original voices of multi-generational immigrants… so that they become an important part of the national narrative on being American,” says NAM Executive Director Linda Sotelo. The stories will be available at the Museum and on their website in audio and digital video formats, bringing the immigrant experience outside of the museum and into the hands of family descendents, researchers, and the general public. By making first-hand accounts of the immigrant experience more widely accessible, NAM is breaking down the harmful stereotypes around immigration that are all too pervasive in today’s political climate. We need your help to continue providing community organizations like NAM with personalized and affordable support. You can support more oral history projects that amplify underrepresented voices and promote cross-cultural understanding in 2018.